When HDDVD lost against Blu-ray, Amazon start to sell all in stock players and movies for a very low price. This is when I got my add-on HDDVD drive for about €20,-. I do not use often this drive because I do not own lot of HDDVDs, but is fun to put them out of the box and play some movies on it. The player itself has a really nice design and workmanship. 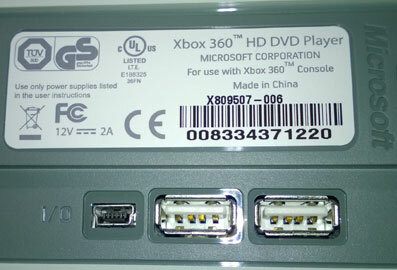 Sure it is kind of annoying, that the XBOX does not have internal drive that supports HDDVD, but this way it even more unique, representing a failed format from the past. Last time I used this drive was at least 5 years ago. And it worked perfectly! I did not expect any suprizes while switching it on. The drive was already connected with the DC power supply for about 1 min., when I noticed this "tsssssssss" noise comming out from the player. When I saw white smoke comming out from the rear of the player, I pulled the mains plug. I knew directly it was e-cap but why??? First I was assuming something is wrong with a DC power supply. I checked, it was ok (stable 12V DC). After opening the player itself it was clear that the e-cap was blown. Other components on the DC/DC PCB were fine. Means the e-cap was malfunctioning itself. Its a SANYO 1500uF/16V WF series 105° type. I checked the web for the same problem and found one result, where someone assumed that the capacitor might be a fake. I do not think it was a fake, because if I would fake an ecap, I would name it "Rubycon" or "NCC". I think it was a chemical defect caused by not using this player for a long period of time. This one must be at least arround 10 years old and should still be ok. Eventually the layers inside this capacitor were getting low resistance connection and heated up the electrolyte until the vent opened and all this mess came out. Thats also explained, why it took about a minute to blow. If the capacitor was stressed by a higher voltage or reverse polarity (what could not be a case here), it will blow right away within a seconds. By the way, this yellow thing on the bottom of e-cap is not the electrolyte. Its a pretty ugly glue and it was hard to remove. The fact that this happened once, could also happened to other drives out there as well. Thats why I wanted to put this problem online, because the solution here is simple. You just replace the capacitor with a comparable one, thats it. At least in my case. But I think if same e-cap would malfunctioning again the worst that could happen it, that it could also blow the fuse. The other components should be ok. 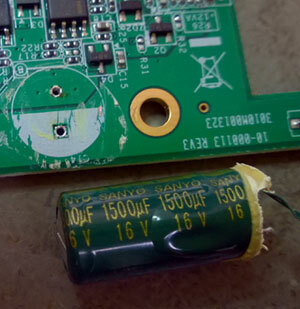 In case of blown capacitors it is advisable not to wait long with replacement. The fluid that will came out of e-cap will damage the circuit board depending on how fine the copper traces are. Grundgütiger !! Die teile gibt's noch? Jepp, ist ein schönes Stück Geschichte! 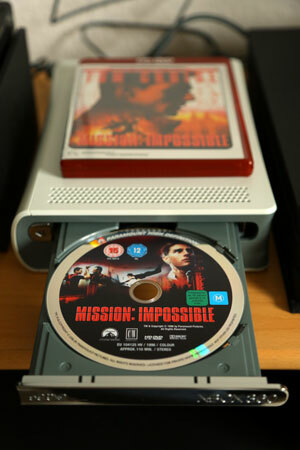 This happened to my new(unused) xbox 360 hd dvd player in couple of minutes of use. I opened the case and the same capacitor was busted. Need to find a new capacitor. This happened exactly the same way to mine a few minutes ago. At first I thought I'd gone and plugged in the wrong PSU adapter, but no - sure enough it's a PSC24W-120. I plugged in the USB cable first then power, and switched on at the socket. Within about 20 seconds there was smoke coming out. Haven't touched the drive in 6-8 years. As I thought, the same will happen to a lot of other drives. Please tell us later if you managed to get it work again after replacing the capacitor.